W.S. Gilbert, in his librettos, rather liked using a device to turn everything upside-down to provide a topsy-turvey mirror to examine the mores of society, and three times he offered to Arthur Sullivan a libretto which Sullivan referred to as the 'lozenge plot'. Sullivan found such devices, which they had used in The Sorcerer, rather unsatisfactory and refused to set the libretto thus forcing Gilbert to search elsewhere, and the result was Iolanthe, The Mikado and The Yeomen of the Guard, where the topsy-turveydom is handled in a more imaginative manner. But Gilbert never let go of his lozenge libretto and following the break with Sullivan would try other composers. The result was The Mountebanks, written with the composer Alfred Cellier and premiered in 1892. 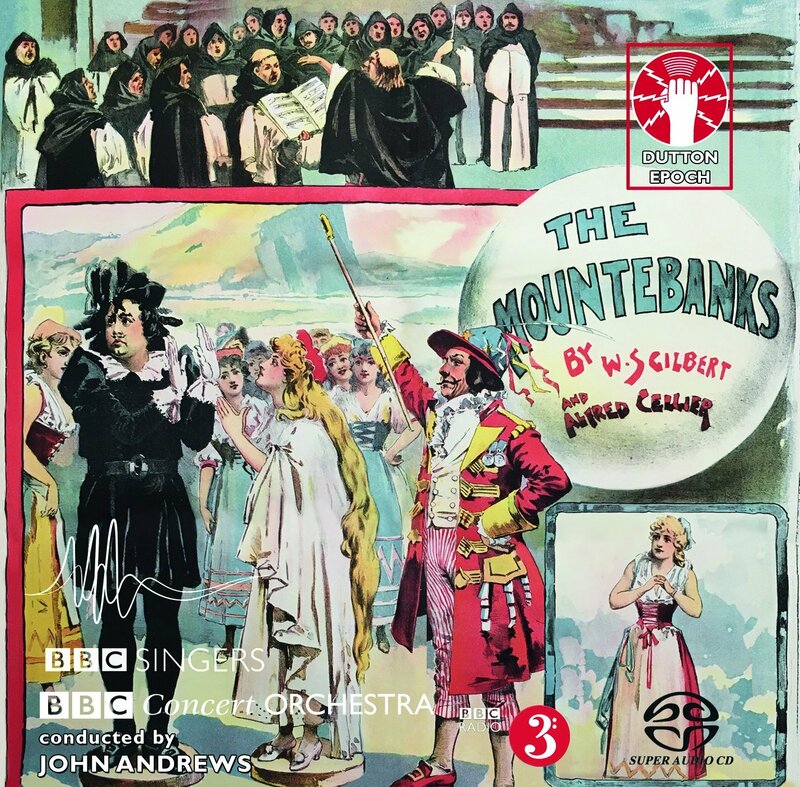 The complete recording of The Mountebanks has been made possible by the re-discovery of Cellier's score (which had gone missing). On this two-disc set from Dutton Vocalion, John Andrews conducts the BBC Concert Orchestra with a strong cast, Soraya Mafi, Thomas Elwin, James Cleverton, Sharon Carty, John-Colyn Gyeantey, Catherine Carby, John Savournin, Geoffrey Dolton, Madeleine Shaw and Martin Lamb, with the BBC Singers. Cellier was a theatre composer with a number of other theatrical works to his name, as well as becoming music director for the D'Oyly Carte company. The Mountebanks is clearly in the Sullivan-style but with a definite sense of a different musical personality. Cellier has a great melodic gift, without perhaps hitting the real highs as some of Sullivan's melodies are capable, but then again we have had Sullivan's hits playing to us regularly since they were premiered whereas Cellier's music has all but disappeared. There is, in fact, a delightful freshness to Cellier's writing and a very distinct sense to his orchestration. In some ways, his orchestral writing seems a little more varied than Sullivan's, or perhaps that is just because of the novelty. Certainly, the disc makes lovely listening. Structurally, I think that Sullivan at his best had the edge and sequences like Cellier's finale to Act One, a sequence of six numbers, do not quite create the overall structural sense that Sullivan was adept at in moments like the final to Act One of The Mikado. Another weakness of the opera, not Cellier's fault, is the plot. You can understand why Sullivan shied away from it, it involves a miscellaneous group of people, monks, a secret society of bandits, various peasants, an innkeeper and a passing duke and duchess. The essence of the plot is that everyone ends up pretending to be something else and in the Act One finale a potion from a local alchemist (who has managed to blow himself up) makes them become what they are not. The antidote is finally found, but not before Gilbert has fun with everyone being fixed as what they pretended to be, bandits as monks and so on. There is a superb cast, who perform Cellier's delightful music with real style and charm, these are clearly singers who are comfortable with the Sullivan style, and perform melodically with not to much operatic heft and plenty of sense of the text. The CD booklet is extensive, but the main body of it is a 10 page article by J. Donald Smith based on his introduction to the critical edition of the score. It provides a great deal of information, yet manages to go into far too much forensic detail about the various changes to the score (Cellier died before the premiere) which are probably not of interest to a first time listener. This article seems to have pushed the plot synopsis out, which seems rather a strange decision. The opera is performed without spoken dialogue (as is usually the case with G&S), but anyone wanting to find out what is going on has to go on-line, where there is an excellent plot summary on Wikipedia and Dutton has the complete libretto with spoken dialogue [opens as a PDF]. Because G&S is so popular we have a tendency to think of the operettas in isolation, but they are part of a wider theatrical culture, which included Sullivan without Gilbert, Gilbert without Sullivan and all sorts of lesser voices. It is a tragedy that Cellier died just as The Mountebanks was coming to fruition, his was certainly not a lesser voice. His opera Dorothy (1886) ran from 931 performances, the longest run of consecutive performances in the 19th century and far outstripping The Mikado which ran for 672. One of the things that Gilbert and Sullivan lost in their working relationship, when they got back together after the break, was the ability to be entirely frank with each other so that the later operas lack the real edge of the the ones from the great period. You suspect that part of the problem with The Mountebanks was that Cellier was simply too nice to Gilbert, and that if their working relationship had developed something a bit more pointed might have been the result. The disc is completed with one of Cellier's rare symphonic works, the charming Suite Symphonique writte for the Brighton Festival 1878. This is a lovely set, and well worth investigating if the wider world of G&S is of interest. Cellier's music has a distinctive charm, and Andrews and his cast perform The Mountebanks with real love. Now what we need is a company to take a real chance, and try the work out on stage!